We have been using Mimaki's products! We are well-pleased with Mimaki's "Speed, Image Quality, and Backup"! Nishimatsu-tent was found in 1980. Their business started with designing and producing tent signages, and now their business has developed to the indoor and outdoor signage for advertising, and signage production. Actually, the JV34-260 was the fifth Mimaki's printer that we have introduced. What is good of the JV34-260 is its print speed. The progress in the print speed is the most prominent point by contrast with the conventional printers. Also, it is really helpful that we can leave the printer unattended without worries by just sending the data to RasterLinkPro and starting printing. If we had to stand by the printer worring about the malfunction of the ejection, or the media jam, it would be pointless to print in the fast print mode. 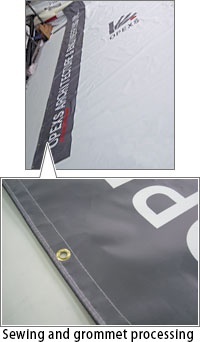 In case of our company, we mainly use wide-width tarpaulin which is really heavy. JV34-260, however, feeds the media with accuracy, and performs the stable printing. This allows us to do sewing of the printed tarpaulin, grommet process, and even go out on a sales call while pritning. 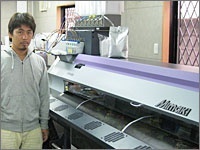 As we started the outdoor signage, we introduced JV2-MS type in 2001, and that was the encounter with Mimaki. At that time, we were looking for the inkjet printer which was able to print on tarpaulin, and Mimaki gave us some advice and told us the know-how about the printers. 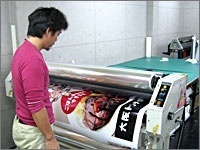 Even after we installed a printer, Mimaki was really helpful that they rushed to our company when we had troubles. Since we recieved orders in signage from the client from our foundation or advertisement agency, we introduced JV3-250 in 2004. On the following year we installed another JV3-250. Since then, we postponed our purchase untill the JV34-260 was launched. With the release of the JV34-260, we replaced the JV3-250 with JV34-260. Nishimatsu-tent develop their original "Tent Signage business", combining "Tent procesing" ― which is their strength ― with outdoor or indoor signage, and ornaments for the exhibition or live performance. Mimaki supports Nishimatsu, who is passionate about their own business, with JV34-260 and JV3-250 as a partner.